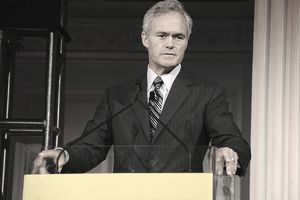 Scott Pelley is the anchor and managing editor of CBS Evening News. He reports for the weekly CBS news magazine program 60 Minutes. You've seen him on TV, and you probably know his name. Here's some more information about him and his background. Scott Pelley marked a return to the hard-news roots of CBS News after the personality-driven tenure of Katie Couric. He replaced her on the anchor desk in June 2011 and viewership increased by more than 800,000 in the next nine months. Pelley has been with CBS News for more than 20 years and has worked his way up through the reporter ranks. He's made his mark by breaking several significant national news stories over the years. Pelley began his career as a 15-year-old copy boy at the Lubbock Avalanche-Journal in Texas. He says he lied about his age because you had to be 16 to be hired at that time. He had his mother drop him off two blocks away from the newspaper's office so no one would catch on that he wasn't old enough to drive. After that, he held several key positions in local television. These jobs began with KSEL in Lubbock, now KAMC, where Pelley worked from 1975 through 1978. Then it was off to Dallas/Fort Worth where he worked at KXAS from 1978 to 1981, and at WFAA from 1982-89. Pelley joined CBS News in 1989 when he began his network career as a New York-based reporter. The correspondents on 60 Minutes are used to winning a plethora of awards, and Pelley has racked up plenty on his own. He was a correspondent on 60 Minutes II from 1999 through 2004 then joined the 60 Minutes broadcast staff. Half the program's awards since that time belong to him. His team has amassed three Edward R. Murrow Awards, three Writers Guild of America Awards and 33 Emmy Awards for investigative journalism. Pelley has many accomplishments both for late-breaking news and for in-depth investigations. He was one of the first reporters on the scene in New York City after the 9/11 terrorist attacks and has reported extensively from the wars in Afghanistan and Iraq. His investigative work includes breaking stories about President Bill Clinton's involvement with Monica Lewinsky. He also received numerous awards for stories about how America discards unwanted electronics. The Columbia Journalism Review said of Pelley in 2012 that he was "the most well-qualified and proven television journalist to ascend to the anchor job." Scott Pelley was born on July 28, 1957, in San Antonio, Texas. He attended Texas Tech University but did not graduate. As a native Texan, Pelley has his home state in common with former CBS News anchors Dan Rather and Bob Schieffer. Pelley has been married to Jane Boone Pelley, who once worked as a reporter at KXAS in Dallas/Fort Worth, since 1983. They have two children, a son, and a daughter.